4 Bosworth Road in Cambridge is a property currently being used in a rather unusual manner; as a commercially let shared house which one can book some of the rooms in on an ad-hoc basis via the Arnies Guest House (Cambridge Guest Lodge) website. The use of the property in this way is currently illegal as the required planning permission is not in place. On the evening of Monday the 5th of March 2012 I observed City Councillors at Cambridge’s South Area Committee vote against asking their officers to take any enforcement action. The committee took their decision even after hearing from the owner of a neighbouring property who attended the meeting in person to tell councillors how he had been affected. He explained how he bought an adjacent house, unaware of the activities going on next door, and had subsequently been forced to move out, along with his partner and young baby, due to the way 4 Bosworth Road was being used. He told the committee he was now renting out the property he had bought as a family home and was himself renting alternative accommodation elsewhere as a result of the illegal use of the property. One of the problems he described was people regularly approaching his home, looking in through the windows, and knocking on the door at all hours of the day and night apparently as they tried to locate the property in which they had arranged to stay. Bosworth Road is opposite Cherry Hinton Hall, to find number four you have to turn immediately right off Bosworth Road as you enter it down a path/drive which isn’t very obviously a road leading to a series of properties. Councillors at the South Area Committee on the 5th of March were told by their officer that a last minute planning application to seek retrospective planning permission had been received just hours before the meeting. This came as a surprise to the meeting’s chair, Cllr Taylor, who told the committee that it hadn’t been mentioned during her briefing. All councillors on the committee, except Cllr McPherson, took the view that taking enforcement action would be inappropriate given the fact an application had been submitted and they voted against doing anything. My view is that this is yet another example of people doing dodgy and illegal things running rings around our weak councillors. 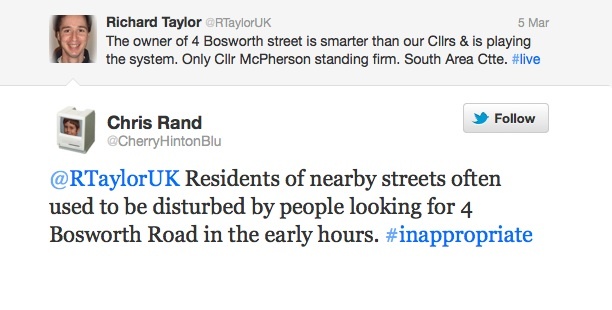 My interpretation is that, as happens all too often, our councillors have again been outsmarted. The application, cynically submitted at the last minute, will buy those running the property more time. The online record isn’t particularly clear but appears to suggest an invalid application form was sent into the council on the 1st of March 2012 and following patient handholding from a council officer the required information was obtained over the next few days enabling the application to be formally acknowledged on the 5th of March 2012. The council received an application for the property to be used as a Bed and Breakfast in 2006 which they refused. Permission for a HMO was sought but not granted in 2011 and a further application was made to the city council but withdrawn. On the 19th May 2011 someone complained to the City Council about the illegal use of 4 Bosworth Road, this prompted action leading to a Planning Contravention Notice being served on the 24th of August 2011 as a pre-requsite to formal action. Councillors on the 5th of March 2012 were being asked to authorise the council’s head of legal services (Simon Pugh, Salary £70,263 / year) to issue an enforcement notice requiring the return of the property use as a dwelling house, but they voted against doing so. In November 2011 D Mapplebeck wrote to the council using a letter head describing himself as being from “UK Law Consultants Co”. seeking to prove the property had been used for more than 10 years as a HMO and B&B he included a pack of evidence including online booking records and statements from individuals. If Mr Mapplebeck had been able to show the property had been used for the period he would have been entitled, under S191(2) Town and Country Planning Act 1990 which was introduced via S10 of the Planning and Compensation Act 1991, to a certificate of lawfulness for the existing use on the grounds it was established. The council rejected the claim that planning permission was not required as the use of the property had been established over ten years. The applicant currently seeking retrospective planning permission for the property is a company called Worldwide Financial Solutions Limited; which has given an address in Edgware, London, on the application form. HOME FURNISHINGS CORP LIMITED incorporated on the 3rd of October 2011 giving 4 Bosworth Road, Cambridge as the registered office address. AUTOMATIVE COMMERCIAL PARTS LIMITED incorporated on the 27th of September 2011 giving 4 Bosworth Road, Cambridge as the registered office address. LEATHER FASHIONS LIMITED incorporated on the 14th of September 2011 giving 4 Bosworth Road, Cambridge as the registered office address. IMPEX INTERNATIONAL CORP LIMITED incorporated on the 4th of October 2011 giving 4 Bosworth Road, Cambridge as the registered office address. GLOBAL ELECTRONICS IMPEX LIMITED incorporated on the 3rd of October 2011 giving 4 Bosworth Road, Cambridge as the registered office address. DOMUS INTERNATIONAL SOLUTIONS LIMITED incorporated on the3rd of October 2011 giving 35 FIRS AVENUE, LONDON N11 3NE as the registered office address. DUBLIN CONSTRUCTION LIMITED incorporated on the 14th of September 2011 giving 4 Bosworth Road, Cambridge as the registered office address. UKHAULAGECO LIMITED incorporated on the 5th of May 2011 giving 1st Flood, 2 Woodberry Grove, North Finchley, London, N12 0DR as the registered office address. UK Law Consultants Co, the “organisation” Mapplebeck used to make the application to the council to recognise the established use of premises doesn’t appear to be a UK registered company at all; the letterhead gives an address in Edgware London, and in a manner reminiscent of the “Paris – New York – Peckham” painted on the side of Del Boy’s Reliant Robin lists associated offices : Dubai – New York – New Delhi – Beijing. The application form for the current planning application lists the owner (or person with 7 or more year’s of leasehold left) as Hugh Young, 16 Bernhart Close, Edgware, London. the first thing that struck me was the smell, not unlike a tramps vest or so I’m told. The T.V. in my room failed after an hour, the electric shower worked for a minute and that too gasped its last. Toilet paper was in short supply but lasted til day three, kitchen, bathroom hall and lounge all dirty and generally untidy. Not so much guest house but a doss house for students. The guest house was noisy during the night….We left as early as we could and went and had breakfast somewhere nice. No one to greet us on arrival, no enough space in bedrooms, breakfast was cold, room didnt feel secure enough, hard to find, no staff present. My room was next to the kitchen which can be used by guest in the evening. Suffice to say, people cooking and chatting at 11.30 at night was not very considerate. In all this was a poor experience and one i would not wish on anyone else! Go elsewhere!!!!!!!!!!! It was a bit troublesom to find as there are no signs nether on the road nor the house itself. The house spread an atmosphere of a shared flat in an poor condition. Checked in had to move room due to mites and the same happened in the next room. Got bitten as did another guest and we packed and left within a very short time (so did the other guests).. This was a bedbug infested dump. I fled prematurly; my body covered in large itchy lumps. The ‘full breakfast’ consisted of a few packets of cereal with dirty plates and utensils. The floors were sticky with dirt. One big flaw in the planning system is that old objections and comments are not automatically carried forward. If an applicant is submitting a series of applications; or makes and withdraws applications, objectors have to be persistent to ensure their view is heard if an application ever makes it to a committee. Comments, including objections, to the current application can be made via the Cambridge City Council’s online planning portal. Given the history of this property I’d like to see the proposal for enforcement action on the agenda for the committee meeting which considers the retrospective application so that if councillors refuse permission they can move straight to enforcement without any delay. This is far from just a planning matter. I think a typical bed and breakfast, or a typical shared house, would pose no problem in this location. The issue is the way this particular property is being run. While some planning conditions could be imposed, for example requiring a prominent sign for the property if it is to be used as a B&B I don’t think that would go very far towards addressing the problems. I would have liked to see the whole range of public sector bodies with responsibility for regulating the use of this property to have got together years ago. The police, fire service, Cambridge City Council planners, Cambridge City Council tourism officers, and trading standards officials from Cambridgeshire County Council along with ward councillors should have all taken a co-ordinated interest in tackling the problems being caused by the use of this property. As so often one of the roots of the problems appear to be poor councillors who have failed to either push for action in this specific case, or failed to put the general processes in place to tackle these kind of matters as they arise. The City Council’s planning department, headed by Patsy Dell (Salary £70,263/year) also has some explaining to do, and ought be more proactive and speedy at tackling those causing a nuisance while flagrantly breaching planning law. Online planning file for current application. This entry was tagged Cherry Hinton, Planning, South Area Committee on March 9, 2012 by Richard Taylor. I’m a former resident of nearby Carrick Close. The reason that guests (who often seemed to be foreign students wheeling around large, noisy suitcases) can’t find 4 Bosworth Road is that, as you point out, it’s hidden away and not signposted. Many used to end up at 4 Carrick Close (and may still do), prompting the owner there to put up a large notice saying: “This is NOT 4 Bosworth Road” to get an undisturbed night’s sleep. However, I assume it’s not in the interest of the owner of 4 Bosworth Road to draw attention to the use to which the property is put with any signage. The lack of action by the Council is disappointing, to say the least, although I wonder if the local residents might have taken more positive action to draw this to councillors’ attention a long time ago. The new section appears to allow councillors not to accept a retrospective planning application in relation to property subject to a pre-existing enforcement notice. I don’t know if Cambridge City Council has developed policies or mechanisms for dealing with such situations yet. If such decisions are put to councillors, there might be a slim difference between a decision to not to accept an application and decision to reject an application. Not accepting an application would save officers and the public the time and effort involved in considering and assessing it. This would not have helped in this case; as councillors were considering asking their officers to pursue formal enforcement action, an enforcement notice wasn’t yet in place. The new law will only apply to retrospective applications which come in once a formal enforcement notice is in place. I have removed a potentially defamatory comment from this thread from Mr Aga. It was all in block capitals and made a series of allegations about the neighbors of 4 Bosworth Road, suggesting their motivations for complaining were not related to problems caused by the illegal use of the property, but were instead racially motivated. WE HEREBY SERVE YOU NOTICE TO REMOVE THE GROSSLY MISLEADING INACCURATE AND BLATANT LIES ON YOUR WEBSITE AND OR TOTALLY REMOVE THE SAME WEBSITE RE 4 BOSWORTH RD CB1 8RG WITH AN APOLOGY ON THE SAME WEBSITE WITHIN 7 DAYS. ANY FAILURE TO DO THIS WILL RESULT IN A HIOGH COURT WRIT BEING SERVED UPON YOU IN PERSON WITH PROCEEDINGS FOR LIBEL AND DEFAMATION. BE IN NO DOUBT THE GRAVITY OF YOUR DELIBERATE ATTEMPT TO CAUSE US HARM AS TO OUR REPUTATION. NO FURTHER NOTICE WILL BE SERVED AND THIS IS BEING COPIED SHOULD YOU REMOVE THE SAME AS YOU DID THE [Name and address apparently of neighboring objector to the planning application, removed] INFORMATION OF HIS BREACH UNDER THE EQUALITY ACT 2010. WWFS LTD UK LAW CONSULTANTS CO.3RD FLOOR 207 REGENT STREET LONDON W1B 3HH.TEL 0333 444 0127 MOBILE 07410 242411 . WE ARE AWARE OF YOUR CURRENT ADDRESS. We write to advise you to read your emails of today serving you notice for defamation and legal proceedings to be commenced in High Court within seven days should yuou NOT correct the grossly misleading and libelleous and unfounded malicious allegations made by you. Stayed there in 2009, wanted to book last month but they say they have not been a BNB since August. Sad, what a lovely place it was. I agree with Mr Aga. I have removed a potentially defamatory comment from this thread from Mr Aga. We act for the owner of the property at 4 Bosworth Road Cambridge CB1 8RG. lies and libellous comments and unfounded allegations made by you and the numerous misleading and grossly in accurate information and hearsay posted on the same or correct the facts accordingly with an apology on your website. We hereby repeat that unless you remove ALL of the adverse comments or substantiate any and all allegations with sound evidence within 7 days with an apology on your website PROMINENTLY displayed for the same period of time as when you initially constructed this site, we will WITHOUT FURTHER NOTICE issue High Court proceedings at the Royal Courts of Justice The Strand London WC2 2LL for defamation and libel against you personally. We shall seek damages, costs and interest in the case. Be assured we are instructed in full to prosecute this matter to the conclusion regardless of costs. No further notice will follow. It is largely a factual report of a council meeting. As such it is in my view much of the material is privileged as a result of the provision in SCHEDULE 1, Part II, Section 11(a) of the Defamation Act 1996. Additional material I believe is fair and accurate reporting and expression of my reasonably held views. If there are any specific elements of the material which you consider defamatory please get in touch with me quoting the precise sections and explaining why you consider them defamatory. My view is that this kind of thing is one of the reasons people shy away from entering discussion of how we run our society, be it at the local level in Cambridge or more broadly. Having received the threat of legal action I have had to consider if I am prepared to risk everything I have in order to do what I consider to be the right thing and continue to publish the material. This is to an extent the question which has to be asked before publishing any material, every blog post and every tweet could potentially be personally ruinous. Should the case reach court, the costs of defending it, even if the judgement was in my favour could exceed my resources. According to the Cambridge City Council website a current application for retrospective change of use of 4 Bosworth Road is currently “pending decision”. My view is the council, and councillors ought be aware that the previous objector is being threatened with legal action as a result of their representations so I will make a representation in relation to the planning application noting this. This threat could put other objectors off raising concerns. I would like to draw the attention of the South Area Committee chair, and those considering the planning application 12/0257/FUL, to the below copied email I have received purporting to be from the owner of the property to which the planning application relates. The message appears to indicate legal action is being taken/considered apparently against someone who commented on a previous planning (enforcement) decision relating to this property as a result of their comments / objections. My concern is that those who may have wished to comment on this application may be put off from doing so by the litigious nature of the property’s owner. This is the concern which I wish to raise with those considering the application and something which I think those determining the application should be mindful of. In addition I hope those considering the current application take account of the points made by the public speaker at the 5th of March 2012 South Area Committee meeting. He attended the meeting in person to tell councillors how he had been affected by the current use of the property. He explained how he bought an adjacent house, unaware of the activities going on next door, and had subsequently been forced to move out, along with his partner and young baby, due to the way 4 Bosworth Road was being used. He told the committee he was now renting out the property he had bought as a family home and was himself renting alternative accommodation elsewhere as a result of the illegal use of the property. One of the problems he described was people regularly approaching his home, looking in through the windows, and knocking on the door at all hours of the day and night apparently as they tried to locate the property in which they had arranged to stay. Could you please advise me the date of any committee which is to consider this application, and if I will be eligible to speak I would like to register to do so (if I am available to attend in person). I am also concerned that action such as this, while beyond the control of the council, may deter people from using the public speaking slot at area committees in general, and specifically in relation to this property and similar cases. While I am happy for, and indeed would expect, the council to publish this representation online I urge consideration of if there is any potential that the below quoted message defames [Name, presumably of commentator on previous planning (enforcement) decision]. I think your first Arkell vs. Pressdram-style letter may mark another milestone in your blogging career. My reading would suggest that use of the word ‘illegal’ might be considered grounds for complaint, although I’m not sure that’s a complaint that would stand in law. Pretty much everything else is just a reproduction of material produced elsewhere. I don’t think anyone disputes the use of the property without the appropriate planning application permission was “illegal”, even the owners/operators appear to accept this, having put in applications seek retrospective permission. Anyone who understands the distinction between the two words unlawful and illegal would probably agree with Edward. The use of a property without the appropriate planning permission may well be unlawful (contrary to civil law), but in the absence of an Enforcement Notice or suchlike it is unlikely to be illegal (contrary to criminal law). 3rd Floor, 207 Regent Street is the base of an outfit called ‘Complete Formations’ who offer a service to small companies who want a prestige address for their registered office. It may however be a different firm offering a similar service at the same place that provides an address and forwards mail. Nobody by the name of Mapplebeck appears on the Law Society’s online database of solicitors, and his cod legal letters appear to be a ham-fisted mangling of genuine solicitor’s letters that sometimes appear online. details of any special facts relevant to the interpretation of the words complained of and/or any particular damage caused by the words complained of. It is desirable for the Claimant to identify in the Letter of Claim the meaning(s) he/she attributes to the words complained of. I don’t see that Mr Mapplebeck has done any of those things. Power to your elbow. As for illegal vs unlawful; the meaning of words for the purposes of defamation action is that which the reasonable person might give to them. Precise technical definitions are not what counts. In any case illegal does mean contrary to the law in a general sense. Describing something as “illegal” does not mean, or suggest, that thing is a criminal offence, though I can see that among certain groups and in a certain context it might be given that special meaning. In general usage “illegal” can even be used quite loosely to simply mean “in breach of the rules”; for example my computer often chastises me if I attempt what it considers an “illegal operation”. As another example, actions in sports and board games which breach the rules are often described as “illegal”. [Name removed, as above] and his solicitors and neither the Planning Committee or parties on thios site have access to or are privy to.Again these parties make a mockery of our offices and locations,comments that we are not on the solicitors panel etc. We are consultant solicitors and operate within the law. It may be these persons who appear to be assocyaes of yours will be added to any proceedings. Mr K Edkins may wish to look at his position and his statements made herein. All parties who make statements on this site are invited to submit their addresses for service of legal documents if so required in the future. Or they may wish to ascertain facts not conjecture or suppositions or pretend to have legal knowledge. It appears they are bold only as far as to put statements which are inaccurate before they write on this site but the question now arises will they wish to be Defendants in defamation proceedings too ? Please look up the new contra website named http://www.4bosworthroad.com for our clients comments and views to be active next 48 hours. It now appears they’ve reproduced the content of my article on their new website. I would speak with the SRA in the morning. I am not sure if the alleged author of the email is attempting to purport to be a solicitor but they manifestly aren’t as there are no registered solicitors with that name (person or organisation) that I can find. The Solicitors Regulation Authority will be able to judge if the email is attempting a criminal act and will be able to take necessary action if it does. What did I say which you allege is untrue? And I haven’t even begun to make mockery of the spelliong, the use of the term “prosecution” in civil proceeding’s, and the stature of a Consultant Solicitors firm which uses a gmail account. However, as an earnest of good faith, I hereby authorise & direct Richard Taylor to delete all my comments from this thread if WWFS will positively assert that Mr David John Mapplebeck, born November 1947, is a UK qualified solicitor. PS I’m sure Mr Richard Taylor would wish me so state that he and I are not assocyaes, associcats or associates in any form. Do you know who the ‘owner’ of 4 Bosworth Rd actually is (as in “We act for the owner of the property at 4 Bosworth Road”) – its not clear from the above. As for the suggestion your response was a Pressdram vs Arkell response – far from it, it looked like a model of polite reasonableness to me! Yes, all of the top lawyers and ‘law consultants’ repeatedly post comments re: forthcoming actions. All of the best ones also ‘keep it vague’ when seeking redress for their clients. Similarly, the hottest ‘legal eagles’ repeatedly misspell the most common words, in order to lull us poor saps into a sense of false security. The sharpest Perry Mason-types have barely a teenager’s grip on the rules of grammar and punctuation. The most devastating legal minds always – and I mean *always* – advise their clients to put together a website to answer all criticisms using a mixture of baffling cross references, insinuations and allegations of shady dealing. I’d be afraid, Richard. Very afraid. This guy could give Lionel Hutz a run for his money. R, I agree about contacting the SRA but also the Law Society. This whole thing sounds very dodgy (spelling, grammar, etc.) And what are “consultant solicitors”?? Either you’re a solicitor or you’re not. I have no doubt that everyone around here would pitch in to help you as we can, with financing or research or advice, so I hope you won’t be deterred. Julian Huppert is on side – and I’m sure we get the wider media involved too. Their “website” is a joke. They even get your blog address wrong (.com instead of .co.uk). If I were you, I might approach the police and tell them what’s going on. This is potentially an attempt at fraud – get you to pay them off to go away. I think these guys may have overestimated the willingness of Cambridge people to have their free speech threatened. They also seem to have overlooked that the larger the list of defendants on their claim form the higher the likelihood of facing well-funded defence counsel. Though they cannot be too serious about winning the case if they refuse to help you identify exactly how you have supposedly wronged their client. We are in receipt of your e mail. 1. Your words “largely factual report” is inaccurate as most of the allegations,statements, comments form third parties were NOT mentioned by any committee members. The meeting convened to our client’s application at approx. 10.10 on the evening of the hearing. The committee made their views after the opening statement of the Chair person. The Council committee then voted on the decision and it was carried that the application was accepted. 3. Our client’s agent Mr Philpott an planning consultant made a two minute response. 4. Our client’s Lettings Manager Mr Aga wanted to address the committee but was advised that as he had NOT booked his time beforehand it was disallowed. In our view you have been given or obtained from Third Parties privileged documents and information which were and are not officially in the public domain or with the Planning Committee at the time of the hearing, previously or subsequently. The total time for the hearing was approximately 25 minutes. All issues and applications and submissions were made by our client prior to the hearing in time and within the parameters of the legislation under the Town and Country Planning Act and there were no breaches of the same by either the Planning Committee or by our client. The comments about our client’s status as to the company and it’s overseas associate offices are libellous and you make a mockery of this in your comments as to “Dellboy” etc. You delete the name of the of no 6 Bosworth Road complainant. We ask the question why? His objections are in the public domain. You have made adverse comments generally about the house in question as to the current position of usage. That is grossly wrong and misleading. We do not accept that under the act as referred to in your reply is relevant as you are a lay public person and not an official of any sort relating to the issues between the parties as a spokesperson. Many of the facts,comments and allegations you allude too are exaggerated and unfounded. We are not going to engage in a rapport about what is defamatory and right on your web site or what is wrong. The onus is upon you to ascertain facts before you published your website. The damage has therefore been done as regards our client’s well being, credentials and status and reputation. You are invited to two solutions and you now have a further six days to carrry out either one or we will issue the Writ of Summons forthwith after that date. The fact that you are to pass on a copy of our client’s instructions to issue proceedings to the Committee is welcomed by us and our client. They have been informed of the proceedings against Mr [Name Removed] some months ago. They too will be updated on your website allegations and malicious and vexatious claims by ourselves. Your excuse for stating that this alleged “threat” of court actions will deter other complainants is unfounded in that the process of issuing court proceedings is to combat persons such as yourself who appear to glorify themselves by wishing to remain in the public limelight as evidenced by your website. Our client and their associates have lived collectively in Cambridge for over sixty years and your mission statement on your website about protecting and making Cambridge a safe place to live in or words to that effect has little meaning as they too have such objectives. We invite you to publish this letter on your website forthwith and leave the same there for the public to read. We note that you have again deleted the comments from our client’s consultant as regards proceedings against Mr [Name Removed]. Our court proceedings will proceed as advised without further notice. Richard, I would – tomorrow morning – contact the SRA and Law Society, as well as Cambridge Constabulary. They should be notified even if they can find no “crime” committed at present. Also, get a good solicitor on the case – if you need help in that dept, tweet it. Good luck – we have your back. Richard, have you seen their website for this case? They accuse you of making “malicious and defamatory and inaccurate information and allegations”. I don’t know how one ‘makes’ information but I wonder if this is a defamatory statement about you? I don’t know how anyone could accuse you of being malicious. Thing’s you seldom see (no. 94): an Solicitor at work at 11pm on a Sunday night. A prompt reply is now sought. We note that your website is not accessible as of today. Please reinstate and we again invite you to put all our letters on the website. We will contimue to monitor all of this during next 6 days. Having asked me to totally remove my website in comment six, now they want me to do better at keeping my website up! I’ve had four text messages from them over the last two days, repeating content reproduced above, largely alerting me to the fact they’ve sent me mail or made comments; including one this morning complaining about the problem with my website. The site’s frontpage wasn’t working properly shortly after a server move this morning, it has been rapidly fixed. Sorry, just noticed you covered the state of the company in the main article. They are also overdue filing their annual return. 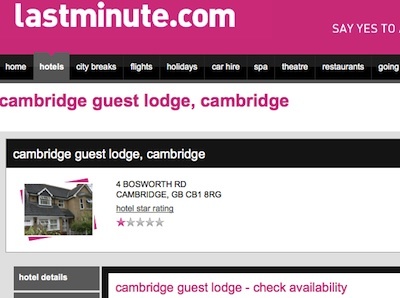 I wonder if they’re taking any action against TripAdvisor for the comments on that website? I’m surprised they’re quoting the Equality Act 2010 – I thought that was only relevant for Employment Law? The Equality act 2010 applies to everything. Businesses are required by the act to make reasonable adjustments for example for a disabled motorist, or person. Also Illegal Vs Unlawful – Illegal is an act or action which is in breach of the law. An action for which there is a punishment. Next is the issue of HMO’s and requiring change of use from a C3 to a C4. If a house has 6 or less occupant unrelated or otherwise then no change of use is any longer required ( https://www.gov.uk/government/uploads/system/uploads/attachment_data/file/5678/1759707.pdf ) so there is nothing to stop the owner converting 2 rooms into say offices or study rooms and letting the other 6 without any need for change of use. As for Mr Taylor’s use of comment moderation definitely seems to suit just himself. Im not sure from this article of his association but it appears that he may be attempting to represent the views or perceived views other Cambridge tenants. Moderation on this page has been transparent; and as noted it has been to remove potentially defamatory material. I am not a “Cambridge tenant”. I’m not seeking to represent anyone else’s views. Permission for part B&B part HMO would not come under any of the use classes; my understanding is specific permission was being sought for the use described. David, every nutter in the country cites either the Equalities Act 2010 or Human Rights Act 1998 in the context of any nutty claim. Both acts are an abomination and the former particularly shameful for being introduced under the radar with no scrutiny in parliament’s washing up period – what on earth were the then opposition parties thinking? At this stage the application will be a delegated decision (this week). Given Councillors on the the South Area Committee considered enforcement or not, it is surprising they are not currently planning to take the substantive decision on the planning application. As I understand it a delegated decision is only possible where there are no objections. My view is there have been comments which need to be taken account of, though they might not have been re-submitted in direct response to the current application. While planners need to consider if anyone could run a B&B / HMO at the property, and not consider the current management, I do think it would be appropriate to include conditions intended to minimize the impact on neighbors. Is that planning officer Mr Evans is suggesting the planning officers the decision is to be delegated to are currently unlikely to be supporting, and approving, the application. The report and decision will make interesting reading. The commenter went further and suggested a specific “Faraz Hashmi” identified on yet another website could be behind the website and perhaps the threat of legal action; that connection not being certain was another reason not to approve the comment. I’ve just checked Radiant Consultants here: http://www.bizdb.co.uk/company/radiant-consultants-gb-limited-08294230/. You can find info about the company’s director as well as its filings submitted to Companies House. The mobile phone number from which I’ve been getting text messages directing me to the threats of legal action posted here have been used as contact number in recent adverts for rooms at 4 Bosworth Road, the number has been associated in such adverts with the names “NEAL” and “ROMA”. I suspect many, or all, of these names maybe pseudonyms used by the same individual . sensitive and therefore not publically viewable. The phone number is the same as mentioned above in comment 43, but this time yet another name is associated with it, this time: “David”. Reply: I am a website developer offering website domains and hosting. We buy the domains for our customers and give them full authorisation of their website with us. We offer the website design only and do not have any connection with the content published on our customers website. Before Me or my company gets involved in this matter can I please be taken out of this and remove my personal details as I haven’t authorised this to be done. Radiant Consultants are the *registrant* of the 4bosworthroad.com domain name, and the contact email address for the registrant is that of Faraz Hashmi. The way to register a domain on behalf of a client is to register it in their name. The client does not own the domain name if it is registered in the name of their hosting company. As it is the domain 4bosworthroad.com is technically owned and operated by Radiant Consultants Ltd / Faraz Hashmi even if that is as claimed a result of them as a web host behaving in, how shall I put it in the nicest way: “not in line with best practices”. It may well be unintentional, but Radiant Consultants are currently ultimately in control of 4bosworthroad.com as they are the registrants of the domain. Radiant Consultants Ltd exists, it was incorporated on 12/12/2011. It is yet to file, and yet to have to have filed, any accounts. I note the http://www.4bosworthroad.com/ website now shows a holding page. My view is that as the registrant of the domain 4BosworthRoad.com Radiant Consultants Ltd is ultimately in control of where that domain points and what is found by those visiting it. I note you have requested the removal of your personal details. Could you please explain exactly what you would like removed, from where, and why. If you wish to make a case that the publication is causing you harm or distress I will of course consider it and decide if the ongoing publication is justified. I note the information published is currently publicly available on the domain registration record for 4BosworthRoad.com so I find it hard to conceive of how publishing an excerpt of that on my website could cause any issues in excess of those which would arise out of the information already being in the public domain. I also note that the name, phone number and email address are being used in the context of business contact information for a limited company and question if they should be considered personal information in this context. I see http://www.4bosworthroad.com/ now points to a holding page and the content previously present appears to be no longer accessible. If you have decided no longer to do business with those responsible for the content on that site I would suggest that is a commendable action to have taken. As it is to all intents and purposes impossible to remove things entirely from the internet once they have been published I suggest the best conclusion here might be a further comment on my website from you explaining the action you have taken and the reasons for it, and perhaps stating that you’ll take more care in the future to ensure domain registration details for your clients are accurate. While I was writing this, a case came up in my constituency, Cambridge. Richard Taylor, a local blogger and an extremely assiduous attender of council meetings who writes them up in immense detail, described a council meeting which was looking at enforcement action against a property in Cambridge being used as a bed and breakfast without the benefit of planning permission. This has led to a rather bizarre libel threat from an organisation known as WWFS Ltd or UK Law Consultants Company, who say they are consultant solicitors. Though I am not an expert in the field, the claim appears to me to be baseless, especially since the people making the claim refuse to say which part of his description they find defamatory. They have gone on to threaten other commentators. “My view is that this kind of thing is one of the reasons people shy away from entering discussion of how we run our society, be it at the local level in Cambridge or more broadly. A number of people with legal training and others are assisting Mr Taylor in the case and I think he will be all right. He is also determined enough to get through. An accurate response is to be set up on http://www.4bosworthroad.com shortly giving the defamation points which Taylor and other parties have stated and giving them the pre action protocol period to apologise and or amend their allegations and comments with hard facts and evidence after which High Court proceedings will be issued without further notice. I understand what your trying to do and respect it. I don’t mind my name being there even my phone number and email address is okay but I would appreciate if my address is removed from the website. I have removed my clients wordpress script and have created a seperate account for them where they can do whatever they want and of which wouldn’t include me in future. I design the layouts and pages my clients want on their websites the content placed in it is up to them. I believe my client will be setting up his website himself. Reasons for my last post regarding all to be removed was because of you and your party thinking of me being the person who is responsible for the “legal threats”. I am surprised to learn that even the address given in the registration information was inaccurate. Could you please clarify exactly what is your information, and in what is your client’s. Perhaps if you let me know what the domain registration information should have been I could note this on my website and remove your address. If you, Radiant Consultants Ltd, are still responsible for hosting the site as your latest comment suggests I think it is important your contact details are readily available and associated with the domain. I note historic domain registration information can easily be obtained via a number of services. All my information is irrelevant to this matter and I do not want to disclose information of myself or my clients as it is privileged which is already available online. You can do all the research you wish I have nothing to hide. Shortly before 17.00 on Friday the 15th of June 2012 Cambridge City Council published a refusal notice in respect of the application to regularise the use of the property. The city council’s online system is rather broken, so a link to the document isn’t likley to work, but it can be viewed from the documents tab of the application’s webpage. The use of the premises as a part bed and breakfast and part house of multiple occupation is likely to result in periods of additional on-street parking, congestion, and competition for parking spaces and general inconvenience to, and conflict between local residents and visitors, which would undermine the level of residential amenity currently enjoyed by them. This demonstrates a failure of the development to recognise and respond to the site context and surroundings. The proposal is therefore contrary to policies 3/4, 5/7 and 8/10 of the Cambridge Local Plan 2006. The delegated report (link unlikely to work) explains evidence the decision was based on and the planning officers’ reasoning. Again the text based document has been published as an image, this time slightly jauntily scanned, perhaps a Dutch Tilt? The reasons for refusal are similar, but slightly different, in the report when compared to the refusal notice. I presume the refusal notice is intended to be slightly more concise. The slightly extended reasoning adds the arrangements proposed involved using the shared turning head for parking, which would compromise highway safety, as people would potentially have to reverse out. Four representations from third parties are mentioned, yet only two, one 14 Bosworth Road, which backs onto the property, and one from no. 12 have been openly published on the council’s website. The council’s website doesn’t show when hidden documents are present on a planning file, I think this is another flaw in the system. Residents will be put of commenting on the planning application by the litigious nature of the owner. The report states: “Full details of the representation can be inspected on the application file”. This is false. Cambridge City Council now has online only planning files (there isn’t a paper copy you can go in and view), and the majority of the third party representations are not available online. Presumably there are reasons other 3rd party comments from number 6 Bosworth Road have not been published. The plans included removing a Birch tree described as “middle aged and in a fair condition”, the officer view was: “While its loss is regrettable I do not consider its removal unacceptable”. As regular readers will know I’m concerned about how caviler the city council are when it comes to taking chainsaws to established trees. In this case the purpose of felling the tree was to provide an additional parking space. Potential noise and disturbance and increased “comings and goings” appear to have been the officer’s main concern. It notes the property is in an otherwise quiet area, so disturbances might be more noticeable – which I think is a very key point. Personally though I would note this property is at the edge of the estate, and near Cherry Hinton Road, so would think this might apply less here than deeper into the estate, however the officer argues the property is well set back from Cherry Hinton road. I’ve not spent enough time in the vicinity to know how quiet and secluded it generally feels around the property. The report, written by identified case officer John Evans, states the determination ie. the decision, was made by someone identified only with scrawled initials: “TW” or “TN”. The Head of Planning’s signature on the refusal notice is annotated with the same scrawled initials. I wonder if the head of planning’s signature is printed automatically, and the elusive and almost anonymous “TW”/”TN” is the actual decision maker. I think the decision maker should be identified, as they clearly have some degree of personal accountability – though of course it is councillors who are ultimately responsible, and who could have decided to determine the application themselves. The domain http://www.4bosworthroad.com/ does not, as promised in comment 52, provide details of “The defamation points which Taylor and other parties have stated”. The domain has been showing a website also available at DealAMotor.com , which currently shows a WordPress site, titled “AutoTrader”, I’ve tweeted @AutoTrader_UK to ask if this is their new website. Perhaps Faraz Hashmi’s nascent hosting company has struck it lucky and landed a huge client? DEAL A MOTOR CO. LIMITED was incorporated on the 24th of May 2012. That suggests that Faraz Hashimi, or at least the DEAL A MOTOR CO. LIMITED company he as the sole director of is now in control of the *content* on the 4BosworthRoad.com domain. Well, all it means is someone with access to the DNS records for the 4br.com domain has set the C record to point to the Deal A Motor website. This Faraz Hashmi character isn’t making much of an effort to distance himself from the 4br.com domain though, is he? You guys really have nothing to than look up WHOIS Information or Directorships. You all seem so happy by getting names and addresses. They do not prove anything! Personally I have to say I’m glad planning was refused. Regardless, one piece of local historical knowledge I may be able to offer, may concern what could possibly be the birch tree mentioned in the report, as I am sure many longstanding residents in the area will recall – the site that the development was built on was formerly the Netherhall School playing field. A birch tree was purchased and planted by Netherhall pupils as a memorial to a Netherhall student who died in a truly horrific manner in a road traffic accident at the site of what is now the pedestrian crossing near the property and Cherry Hinton Hall itself. I sincerely hope that this was not the tree in question whose loss is viewed by the council as merely “regrettable” but not “unacceptable”. The council appears not to be aware which trees are memorial trees, there have been other cases where it has only been local residents knowing the history and intervening which has ensured the council and councillors are properly informed. I don’t think a tree being a memorial tree ought preclude it ever being felled (especially if unhealthy or dangerous) but it ought be a factor taken into account and given significant weight when deciding what to do. It may be for example a new tree could be planted, or something incorporated into a new development. The council maintains a database of trees in the city, perhaps they ought add a field for noting memorial trees? I have today been sent, by email, a rather bizarre 34 page collection of documents, of varying ages, relating to Bosworth Road. I won’t be publishing the pack of information as it contains personal information relating to neighbors of 4 Bosworth Road clearly marked private and confidential. No part of the correspondence appears directed to me, though I am copied, as is Julian Huppert MP, the Planning Inspectorate, Cambridgeshire Police and others including a Cambridge City Council planning officer. The material has been sent by an E Clark of TWEEDIE & PRIDEAUX LAW SERVICES LTD ( http://www.tweedieandprideaux.com/ ). Tweedie and Prideaux Law Services Ltd describe themselves as “the successors in title to UK Law Consultants Co and now have the full conduct of this matter”. Tweedie and Prideaux Law Services Ltd is Company No. 08306638 incorporated on 26/11/2012. The substance of the newest material is that they state their “clients” have complained to the police about neighbors complaining about them, alleging their complaints are racially motivated. Personal correspondence from others included shows that one of the neighbors has engaged solicitors to respond to the various allegations being made against them. The latest letter suggests a site visit by the planning inspectorate is expected at 4 Bosworth Road on Tuesday the 9th of July 2013. The council’s online planning portal states an appeal is in progress in relation to the application for retrospective planning permission discussed in the above article. There is a document in the electronic case file noting that planning inspector S Warder MA BSC(Hons) DipUD(Dist) MRTPI is to visit the appeal site (4 Bosworth Road) at 10am on the 9th of July 2013. The letter states that he expects “both parties” to be present. Presumably the parties in this instance are the council, and the applicants. Perhaps the council will send officers, or perhaps the Chair of the South Area Committee, Cllr Robert Dryden ? Cambridge City Council’s online planning system has been updated to say the planning appeal has been dismissed. The appeal decision letter is dated 17 July 2013 and was posted on the council’s website on the 22nd of July. I consider that the proposed uses would increase movements along the shared access at the front of the property and heighten activity in the confined rear garden. Having regard to the tranquil character of the surrounding area, this would lead to unacceptable levels of noise and disturbance which would be detrimental to the living conditions of neighbouring occupiers. The appellant has drawn my attention to documents relating to legal proceedings against an objector to the proposal who, it is claimed, misled a meeting of the Council’s planning committee. However, that dispute is not a matter for this appeal. I have determined the appeal on its planning merits based on the evidence presented by the parties and my site visit. Whilst I have had regard to the concerns expressed locally, they have not been decisive in the conclusions I have reached. This property is currently set up a very lucrative investment property making it ideal for an investor to just take over the property as it stands. No reference is made to the planning situation. Indeed but also the article is about large numbers of people in the house. If the owner wished to have 6 or less people in the house a Change of use would not be needed. That depends on what the arrangement is; making the primary use of the property a bed and breakfast business would, as I understand it, require planning permission. It is still on the market, now with a different agent and with an even lower price of £595,000. Breaking news today – Assume this is the same place? which refers to a council press release which appears to have been removed from the council’s website. It may or may not refer to the same property on the road, readers should make up their own minds after carefully reviewing the material available; even if the same property is involved different companies and individuals could of course be responsible for latter occurances. A Freedom of Information request to the council might provide clarification / enlightenment.